Now is the time to upgrade your arsenal. 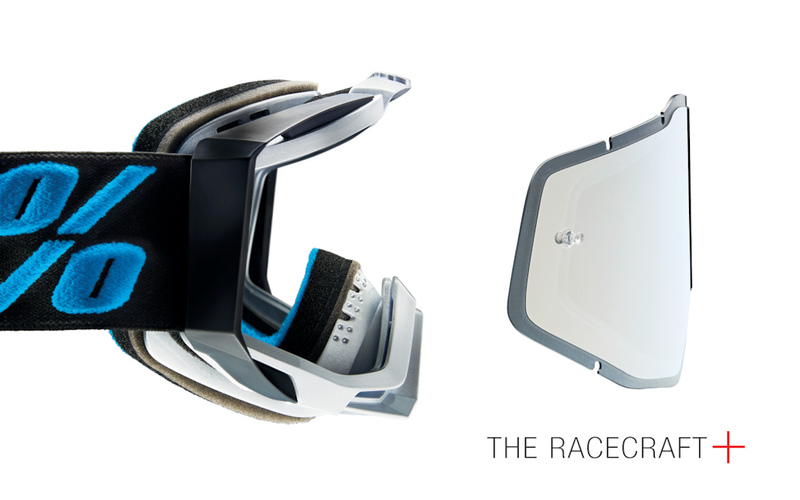 The most renowned goggle on the market just got better; the Racecraft has evolved. Introducing the Racecraft+. With the ever-progressing speeds of riders, the demands of a goggle increase with it, so we stepped up to the plate. We have armed the Racecraft+ with an injected polycarbonate lens to increase visual clarity and protect against the demands of today’s racing conditions. An elevated lens retention wall ensure the Plus + shield lens stays secure, and the four layer face foam offers the ultimate sweat absorption. Experience confidence inspiring protection and superior clarity with the Racecraft +. How about actually stepping up the game with magnets in the lens? Swapping out lenses never has been easier. This is a standard in wintersports for a long time. @fracasnoxteam: OAKLEY maybe??? It s a small un-kwon brand I guess!!! hahaha Just joking man. @smoranc: yeah maybe, i don't care who sponsor who. Discrediting something as "group think" is sort of "group think" in its own right wouldn't you say? @SteezyStu: the evidence is clear. Group think is fun to take note of...especially when demonstrated by the drones of the lamestream media(leftists) via clip montages..
@jrocksdh: not sure it's exclusively a left or a right thing. Seems to be a human thing. So I’m asking a real question...The article says there is a lens retention wall to keep the lens secure. Has anyone ever had there lens come unsecured? Or unsecured while riding? Not that I know. But you know the marketing guys. They like to make obvious things look huge! I once had a rock hit my lens, pushing it back into my face splitting the bridge of my nose. I've never had a lens just fall out or come loose. Yes faceplate with the fox air, gouged lens which was pushed within the goggle frame. They did there job guarding my eyes. @Brycelewis: How bad a crash? Also that sounds like a bad time! Oh man, it started in 1980 with some guy from Norway, that took one of the most popular programming languages to the level, that it could support object-oriented programming and called this C++, what basically means C + 1, (++ is used in loops for incrementing loop counter by one). Saw this a week ago on vital and many things were the same in this article. Why should we replace our current ones? What are the colors, prices, and performance? A lit is lacking from this article. It's really just a change to a thicker, molded poly lens. Same thing Fox and some others have been doing for a few years, and those goggles are awesome. Since the lens is pre-molded into shape it gives off a lot less distortion and has better scratch resistance. How about make the coating a bit better on the lenses. They get scratched when you look at them. Some day the bike-goggle world will catch up to the alpine-ski google world. Or maybe not. I don't think it's a matter of catching up, it's a matter of what we actually need from a goggle in the respective sports. Winter sports obviously demand a lot out of a goggle, biking goggles are essentially just safety glasses. But as far as tech, Oakley has transferred their PRIZM lenses to biking, and Smith are now using their Chromapop lenses. And where is the anti fog coating?? ?